IPA is pleased to announce that Dr. Dilip V. Jeste, M.D. has been chosen as the new Editor-in-Chief of International Psychogeriatrics, the prestigious academic journal owned by the International Psychogeriatric Association (IPA) and currently published twelve times per year by Cambridge University Press (CUP). This is a four year appointment beginning 1 October 2017. Dilip V. Jeste, M.D. is a geriatric neuropsychiatrist who specializes in schizophrenia and other psychotic disorders in older adults, as well as positive psychiatry, successful aging, and neurobiology of wisdom. 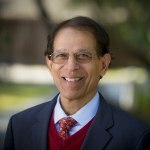 He is the Senior Associate Dean for Healthy Aging and Senior Care, Estelle and Edgar Levi Chair in Aging, Distinguished Professor of Psychiatry and Neurosciences, and Director, Sam and Rose Stein Institute for Research on Aging, at the University of California, San Diego (UC San Diego). Education and Professional Experience: Dr. Jeste obtained his medical education in Pune and psychiatry training in Mumbai, India. In the US, he completed psychiatry residency at Cornell and neurology residency at George Washington University. He was a Research Fellow and later, Chief of the Units on Movement Disorders and Dementias at the National Institute of Mental Health (NIMH) before joining UC San Diego. There he started a Geriatric Psychiatry program from scratch; today it is one of the largest Geriatric Psychiatry Divisions anywhere. Research: Dr. Jeste’s main areas of research include schizophrenia and other psychoses, pharmacologic and psychosocial interventions, and successful aging. He has been Principal Investigator on a number of research and training grants, and has been funded by the National Institutes of Health (NIH) continuously for 30 years. His work includes clinical, translational, and services research, primarily in the areas of relevance to mental illness, mental health, and aging. Specific areas of his interest have been late-onset schizophrenia, psychopharmacology, psychosocial interventions for older people with schizophrenia and related disorders, psychosis of Alzheimer’s disease, accelerated biological aging in schizophrenia, and sustained remission of schizophrenia in later life. In recent years, he has been promoting Positive Psychiatry, emphasizing mental health and ways of enhancing it through positive traits such as resilience and wisdom. Publications: He has published 12 books including Successful Cognitive and Emotional Aging (2009), Prevention in Mental Health (2011), and Positive Psychiatry (2015). He has also published more than 625 articles in peer-reviewed journals and 140 invited book chapters. His work has been cited in the Time, Atlantic, NY Times, Washington Post, Wall Street Journal, London Times, Public Radio International, etc. Training: Dr. Jeste has been involved in research and clinical training of high school students, undergraduates, graduate, medical, nursing, and social work students, fellows, and faculty. He is also passionate about community education. Editorship: Dr. Jeste served as the Editor-in-Chief of the American Journal of Geriatric Psychiatry from 2001 to 2015. Under his leadership, the journal became the top publication in the field, in terms of the Impact Factor and downloads. Honors: Dr. Jeste is a member of the National Academy of Sciences, Engineering, and Medicine, and was a member of the NIMH Advisory Council and the inaugural NIH Council of Councils. He was listed in “The Best Doctors in America” and in the Institute of Scientific Information list of the “world's most cited authors”--comprising < 0.5% of all publishing researchers of previous two decades. Dr. Jeste was a Past President of the American Psychiatric Association (APA), the American Association for Geriatric Psychiatry, and the West Coast College of Biological Psychiatry, and Founding President of International College of Geriatric Psychoneuropharmacology. He has received Commendation for Dedicated Service from the Veterans Affairs and awards from NIMH, Society of Biological Psychiatry, APA, Institute of Living, National Alliance on Mental Illness, National Alliance for Research in Schizophrenia and Affective Disorders, American College of Psychiatrists, and Universities of Pennsylvania, Pittsburgh, Cincinnati, and Maryland, and Cornell. International Psychogeriatric Association (IPA): Dr. Jeste is a Life Member of the IPA. He has given several lectures at IPA conferences, including Raymond Levy Lecture (Beijing, 2014). He received IPA’s Award for Service to the Field in 2005. Other International Activities: Dr. Jeste has strong international interests. As APA President, he established a new APA Council on International Psychiatry to facilitate international collaboration. He has received Honorary Fellowship, the highest honor it bestows, from the UK’s Royal College of Psychiatrists; Honorary Professorship from Universidad Peruana Cayetano Heredia, Lima, Peru; Asian Heritage Award for “Excellence in Science, Technology, and Research” from Asia; Visiting Professorship, Royal Australian and New Zealand College of Psychiatrists; Certificate of Honour, Indian Psychiatric Society; Indo-Global Psychiatric Initiative Award for Academic and Administrative Skills; and Award for Significant Contributions in Neurosciences to World Psychiatry, from the Asian Federation of Psychiatric Associations. Recent Contributions: Dr. Jeste has been widely recognized for his contributions to the scientific community. As the (APA’s) President during 2012-13, he spearheaded the process of finalization, approval, and publication of the DSM-5. He also expanded APA’s international membership, and focused on Positive Psychiatry .Dr. Jeste developed the newly launched UC San Diego Center for Healthy Aging, a unique, multi-professional center, breaking the traditional silos of academic disciplines by bringing together best scientists from varied professional backgrounds such as engineering, technology, pharmacy, gerontology, social science, and arts and humanities, to work collaboratively on different aspects of healthy aging.